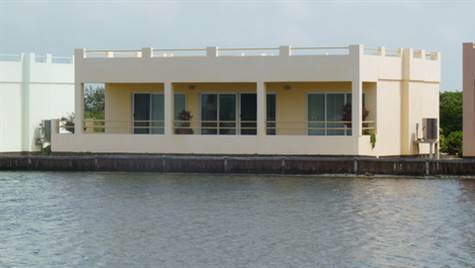 Ambergris Caye, Belize - Condos are nice but wouldn't you rather have your own villa? Now you can get your own 3 bedroom 2 bath villa for the price of a condo. New construction and never been lived in, this villa comes fully furnished so you just need to bring down your swimsuit and flip flops and move right in. Excellent quality of construction, solid concrete on all interior and exterior walls plus a concrete roof. Very low maintaince, low property taxes and low monthly HOA dues. Close enough to walk or ride a bike to town and you can't beat its location right on the lagoon. Sunset views from any room in the house and a huge roof top deck for outdoor entertaining. Fully furnished with appliances, furniture and linens. If you like boating, keep your boat right at your front door step and be out to the reef in minutes. Look around, you won't find anything else comparable at this price of $287,500 anywhere else on Ambergris Caye. Contact me to BUY IT NOW.